Tom Schneider values developing a personal relationship with the people he works with. 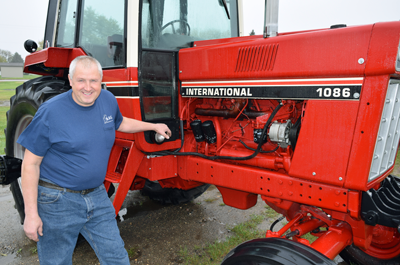 The owner of Greenwald Farm Center Inc. in Greenwald, Minnesota, likes the fact that his customers receive such prompt service from Stearns Bank. Tom has worked with Stearns Bank customer relations representative Terilynn Palmer for years and knows his customers will get their farm equipment fast. Greenwald Farm Center specializes in selling used farm equipment. Tom has owned Greenwald Farm Center since 1993. “Stearns Bank is so impressive. We can usually get customers approved within two hours,” Tom said. “Even when we work with people from out of state, I give Terilynn a call and get them set up with Stearns Bank. "Stearns Bank’s speed benefits my customers because financing gets done in a timely manner. They know what’s going on and they can get their equipment in the field right away." Terilynn’s personality and friendly demeanor go a long way to helping Tom cement financing for his customers. “She’s always cheerful, outgoing and positive,” Tom said. “When I’ve worked with other banks, there is too much paperwork involved. I don’t have time for that. When I’m dealing with Stearns Bank, they simplify the paperwork so I don’t have any headaches."